* Some items for sale will have numerous gift wrap options. Other items only have one option that we have found is most appropriate for that item. Collage (above) shows some examples of what you could receive. Please see individual product pages for options available for that particular item. * The price for gift packaging varies depending on the size and shape of the item you have purchased, as well as the gift wrap option you chose (if applicable). If you have any questions about gift wrap options, please Contact BarbaraEden.net Customer Service before purchasing. * Some options include a blank gift card or tag. We can fill out the To / From portion if you let us know during checkout. (Due to the limited space, we cannot add messages to gift tags or cards, but we can put a note on the packing slip.) See "Checkout Instructions for Gift Purchases" below for more details. (1) On each product's page that has a gift option, you'll see a space to include a short gift message. This gift message should be 5 words or less. 5 message limit does not include the To/From names. Please note: Gift message will only be printed on te packing slip. NOT the gift tag. Packing slip for gift purchases will also not include price(s). (2) Also during checkout you'll see a box that states "Leave a message." In that field please paste the following, please let us know in that box if the order is being mailed directly to the gift recipient(s). If your gift wrap option includes a gift tag, we will be sure to write or type your name in the "To" section and gift recipient's name in the "From" section on the gift tag, as long as you provide us with those names. For the aforementioned items though, we can make sure the packing slip inside the box does not include item prices, just let us know during checkout in the "Leave a Message" box that it is a gift and we'll remove the prices from the slip. INTERNATIONAL ORDERS: Due to Customs, most gift wrap options are unavailable for International customers. 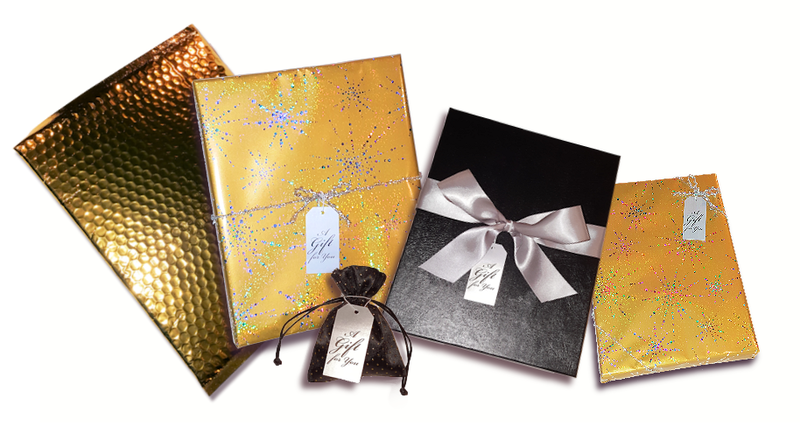 IF a certain gift wrap option is available for International customers that will be designated on that product's page. We apologize for the inconvenience and appreciate your understanding. NO REFUNDS ON GIFT WRAP FEES: Gift Wrap fees are non-refundable, unless the gift wrapped item is (a) damaged or lost in transit -AND- (b) the sales price of the damaged or lost item is being fully refunded. If a replacement item is being sent to customer, we will ship the replacement item gift wrapped, so gift wrap fees will be non-refundable.